“History would have been very different,” writes P.J. O’Rourke; “a C+ at least — if the Baby Boom had ruled the world.” Born in the two decades between the end of the Second World War and the advent of The Beatles on US shores, the Baby Boom is a 75-million-strong demographic that got American history in a headlock in the Sixties and likely won’t let go for another couple decades, given the way the next election’s shaping up. As a generation (and a generalization) they are responsible, near enough entirely, for the world we live in now. And the contradictions of a generation that can be all Haight-Ashbury one minute and selling collateralized debt obligations the next may seem too titanic for a single book to lasso. O’Rourke, though — a journalist, satirist, commentator, and sort of one-man fourth estate — is up to the task. It helps that O’Rourke is one of the funniest and sharpest commentators of his generation. Not for naught is he allegedly the most cited living person in The Penguin Dictionary of Modern Humorous Quotations. Having refined his wit in a series of assignments as “the world’s only trouble-spot humorist,” he has a pitch-perfect ear for the absurd (“It’s surprising how small the hole is in the end of an AK-47, considering what a big difference it could make in your social life”) and a very healthy level of cynicism (“the people who insist on organizing life and the people who have no idea how life is organized were and always will be the same people”). These are some of the many defining qualities he brings to his work for The Daily Beast, which you can read here. But back to the Boom. The power of our generation is our music. But, in the interest of speaking truth to power, I looked at the Billboard Top 100 for the year I went from junior to senior in high school. We liked “Everybody Loves Somebody” by Dean Martin (no. 6) better than we liked the Beatles’ “Can’t Buy Me Love” (no. 52). We liked “We’ll Sing in the Sunshine” by Gale Garnett (no. 8) better than we liked the Kinks’ “You Really Got Me” (no. 78). The Rolling Stones didn’t make the chart. there was all that wonderful music — the Doors (not there), Led Zeppelin (not there), the Byrds (not there), the Moody Blues (not there), Jethro Tull (not there), Joni Mitchell (not there but wrote “We’ve Got to Get Ourselves Back to the Garden” after she heard about it), and Melanie (there but didn’t write “Lay Down (Candles in the Rain)” until someone told her she’d been there). But what some might consider to be the flaws — spiritual, ethical, logical — in Boomers are, for O’Rourke, the key to why the Baby Boom is “the best generation in history.” And his notion that a leisure-focused, self-interested, casually dressed demographic with large disposable incomes will be naturally uninterested in oppression and warfare is pretty persuasive. Depending on your political persuasion (and facility with stats) he’s perhaps also right that declining crime and poverty rates are the natural byproducts of a society engineered around the promotion of the self, at least with such a large percentage of the population buying into it. 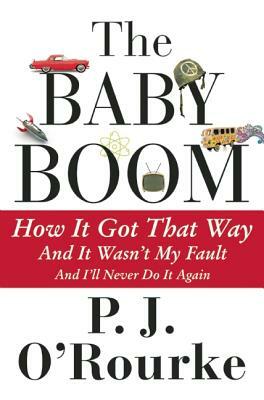 The Baby Boom doesn’t push an especially positive image of a generation (C+, remember?). But it does suggest pretty convincingly that things are an awful lot better than they might be. For more, check out this interview with O’Rourke, from ReasonTV. P.J. O’Rourke will appear at Runnin’ Wild, the House of SpeakEasy Gala, on January 28 at City Winery. Tickets can be purchased here. We will return to our regular pricing for our Seriously Entertaining show No Return on March 9.